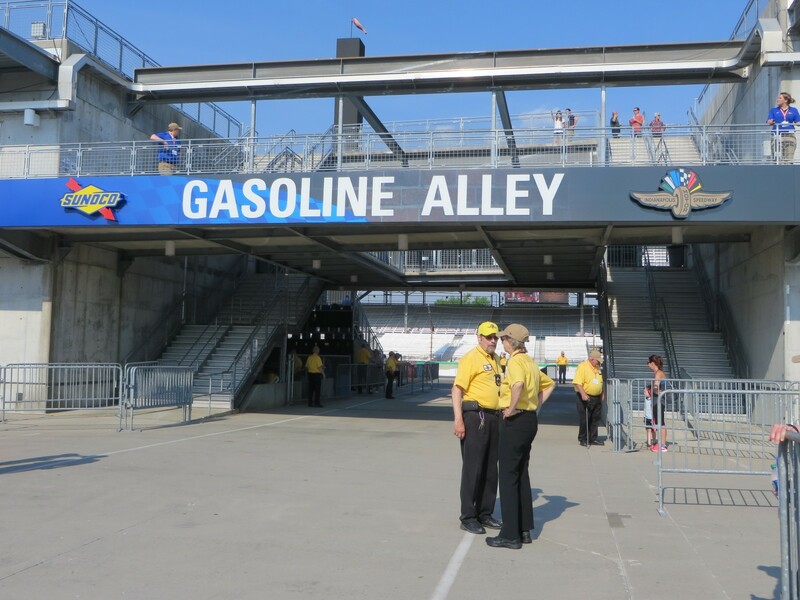 Friday morning the Verizon INDYCAR Series race cars queued up and paraded out through Gasoline Alley to Pit Lane at the Indianapolis Motor Speedway for the first session of the month – practice for the INDYCAR Grand Prix. This is the fourth year for the road course race, utilizing various infield portions of the Speedway, making it a 14-turn, 2.439-mile circuit. The weather was mostly cloudy for the 9:15am session, chilly, breezy, a wind chill factor of 55 degrees F. The session got off to an inauspicious start with a very early red flag for debris. The field has 13 Hondas and nine Chevrolets. 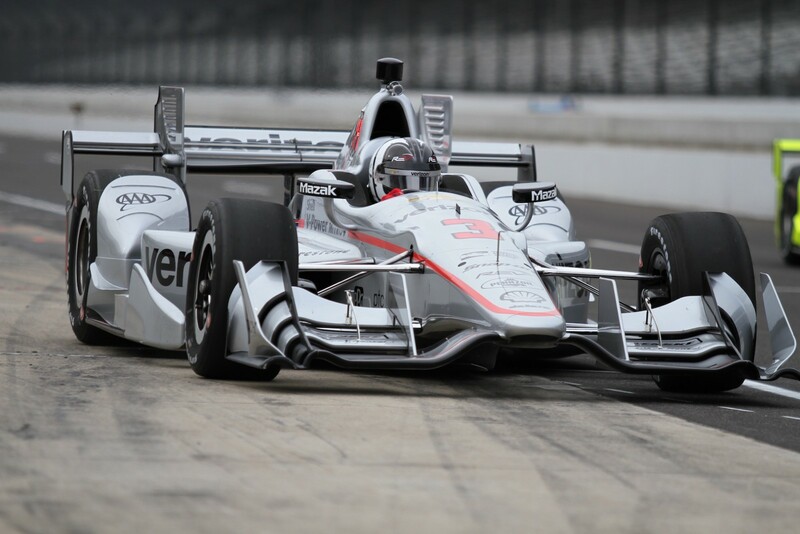 Will Power/No.12 Verizon Team Penske Chevrolet led the field Friday in the first practice. He turned his fastest lap of 1:09.3172 / 126.670 mph on his last lap as the checkered flag about to fly, rising to the top for the first time in the 45-minute session. 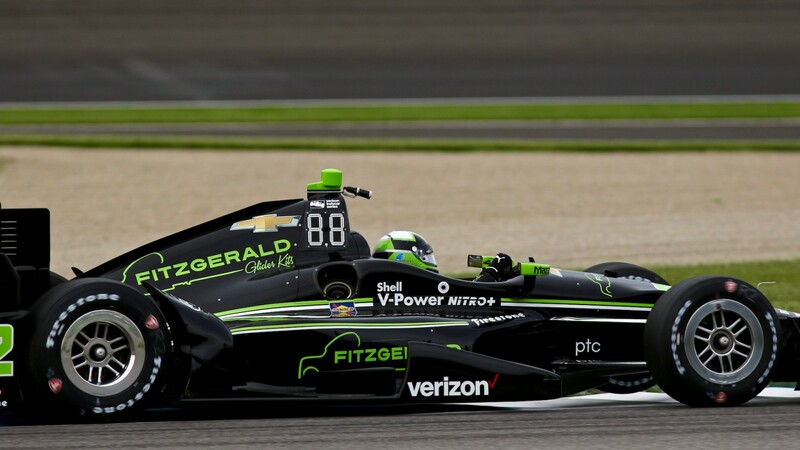 Power edged past Joseph Newgarden/No.2 hum by Verizon Team Penske Chevrolet who had been leading and led two other times; and Scott Dixon/No.9 NTT Data Chip Ganassi Racing Honda, who was running third and had led twice earlier. The qualifying track record is 1:08.6746 / 127.855 mph set last year by Power in the first round of knockout qualifying. 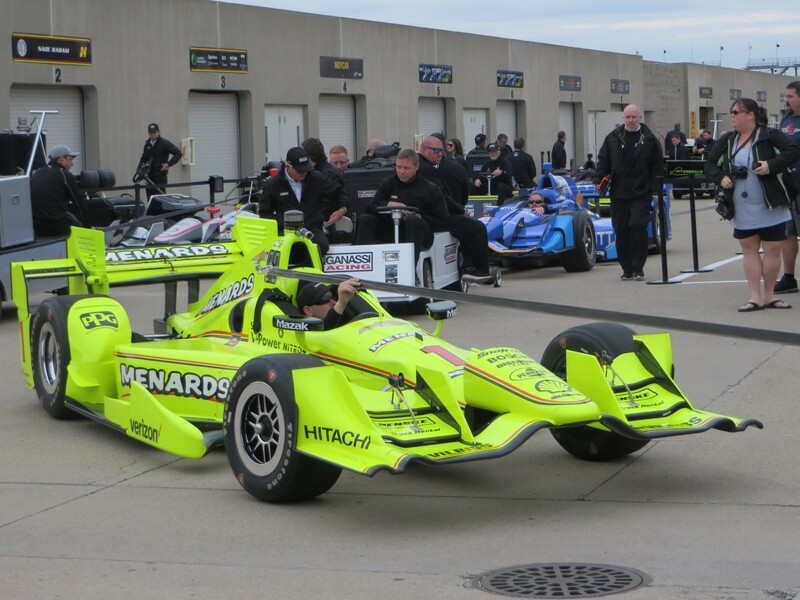 Last year’s pole was 1:08.7696/127.832 mph, set by Simon Pagenaud, who went on to win the race. He also won the inaugural GP in 2014, with Will Power the 2015 winner. 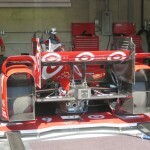 Juan Pablo Montoya. Photo by Nico Matamoros. Juan Pablo Montoya/No.22 Fitzgerald Kits Team Penske was seventh fastest, in his first INDYCAR race of the season, since he left Penske after the end of last season. 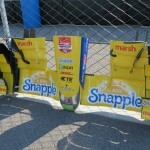 “I got an idea this morning of what we needed out of the car, and I think it helps. Even though we screwed up in the first session.” Later, JPM joked that he had to come back and lighten things up for the team, as they were getting too serious. Helio Castroneves/No.3 Verizon Team Penske Chevrolet was twelfth. This weekend he is running the silver Verizon livery on the road course chassis. 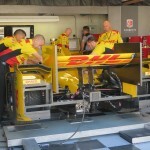 For the Indianapolis 500 he will run a new gold livery for Shell Fuel Rewards on the Speedway chassis. 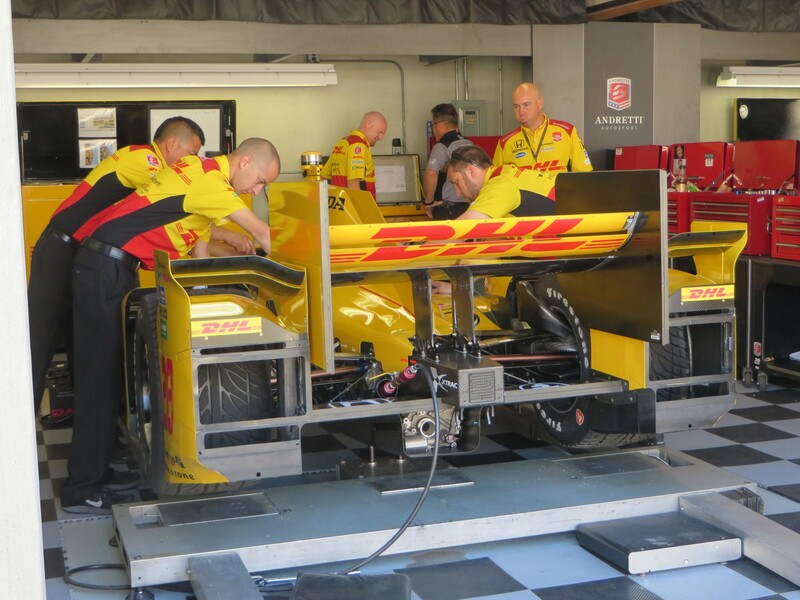 Travis Law, the Chief Mechanic for Castroneves’ car said that livery changes are labor intensive. 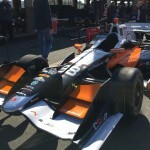 The No.3 car has six different primary sponsors, which means six complete graphics changes for the driver, crew, and all equipment as well as the car. Everything changes. 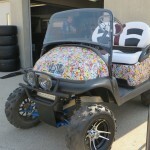 The Verizon car is a wrap, which takes about eight hours. Four of the guys in the Paint Shop help out with some specialized outside hired help. 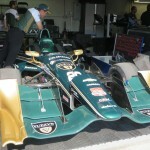 The special gold livery for the Indy 500 is painted on, with PPG help. 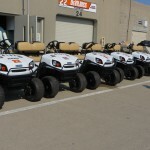 PPG is one of the team’s sponsor and has been a great help with the technology as well as color design. It takes days to complete. 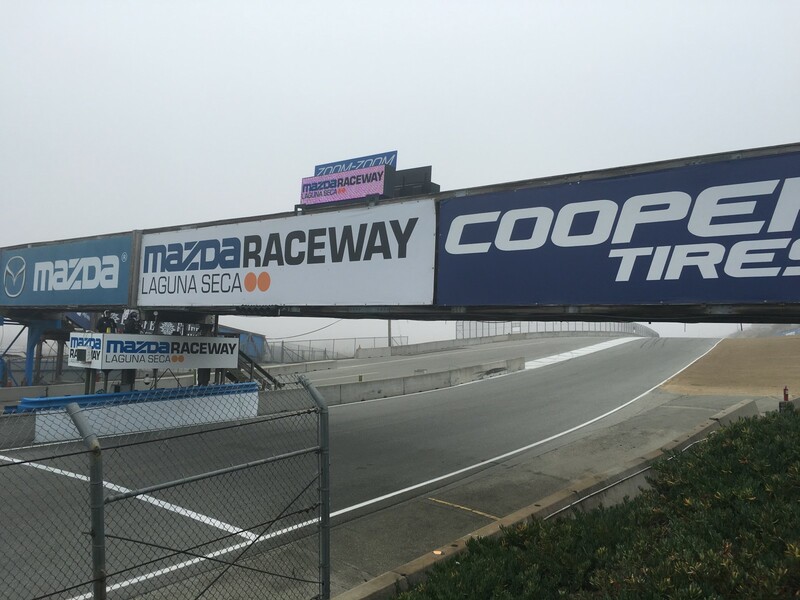 This weekend there also are three support races from the Mazda Road to Indy Grand Prix Presented by Royal Purple Supporting Lupus Foundation of America Series: Cooper Tires USF2000 Powered by Mazda; Pro Mazda Presented by Cooper Tires; and Indy Lights Presented by Cooper Tires. Indy Lights has a field of 14 drivers, from six countries and the US. Half the drivers are Rookies. 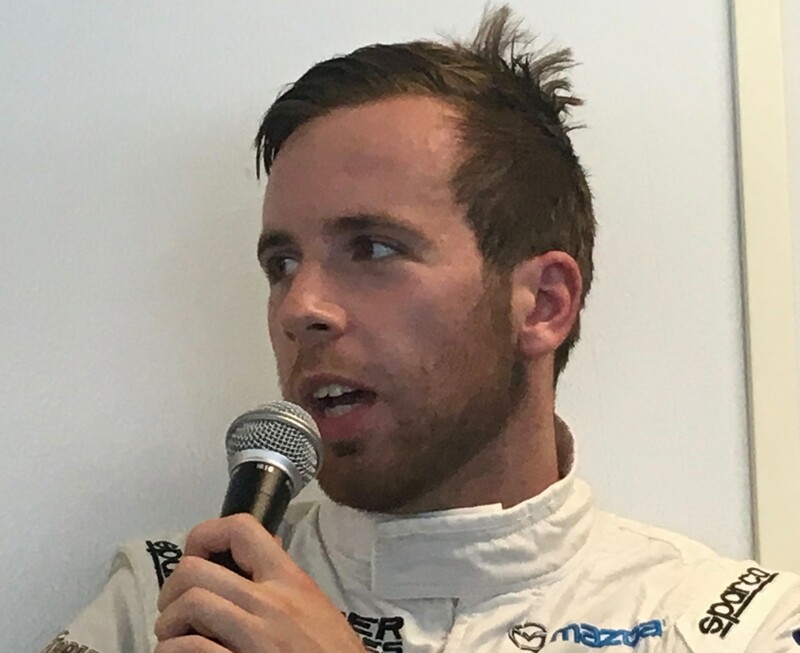 The Pro Mazda field is 15, with three countries and mostly US drivers represented. Ten are Rookies, and four are in the National Class – which means the driver either has an older spec car, or is older than a kid. The largest support race group is the USF2000 field, with 23 drivers, including two women – the only group with female drivers. Ten countries are represented, plus the US, and 17 are Rookies. What fun! Five of those foreign drivers commute from home or another country, while the others have more local addresses. 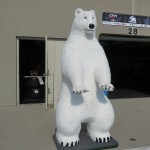 Thursday was a test day for the Mazda Road to Indy Series, the three support races this weekend. Their sessions were run under cool, heavily-overcast skies. The track was wet from the Wednesday late night rain, but it dried quickly. 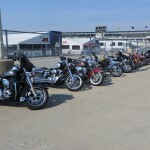 Friday’s schedule called for practice and qualifying for all four groups and races for the three support groups. Mega delay in posting due to WiFi problems. So sorry. Universal Frustration. 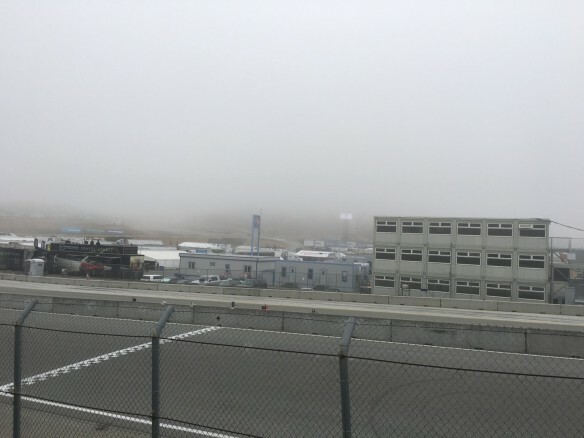 Sonoma Raceway is having a typical North Bay Area summer, with morning overcast shifting into sunny skies. 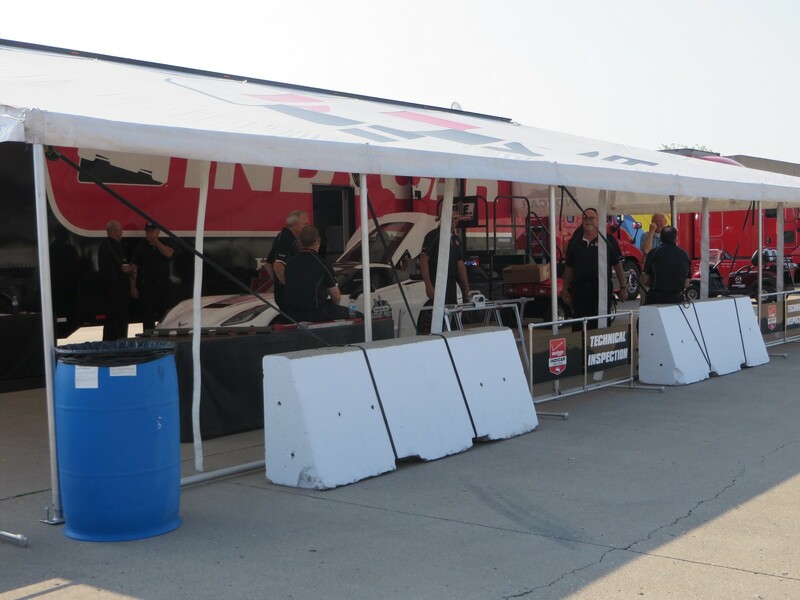 There was a gentle breeze as the Verizon IndyCar Series cars took to the elevated road course for their first practice session of the weekend, scheduled for 75 minutes. The temperature was forecast for a high of 84, but for the late morning Practice One, it was just nice and mild. Saturday and Sunday are said to be warmer each day, reaching 95 on Sunday afternoon for the race. Marco Andretti . Photo by Pablo Matamoros. Practice One was relatively benign, with the times not changing much. While all 22 drivers went on track, most were slow to turn more than a few laps, and by midpoint, only a handful had turned double digit laps. 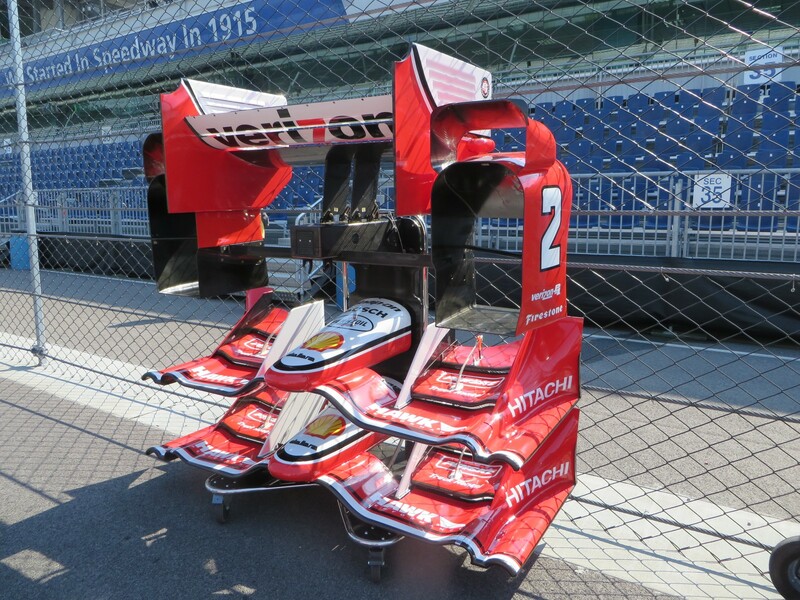 Helio Castroneves/No.3 Hitachi Team Penske Chevrolet was top all session at 1:17.3298, followed by Marco Andretti/No.27 Snapple Honda in second at 1:17.4611. 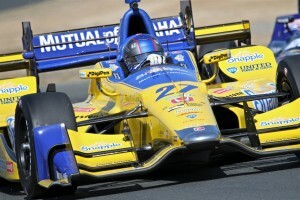 Andretti hasn’t had the best of seasons, languishing seventeenth in the standings, 264 points behind Pagenaud. 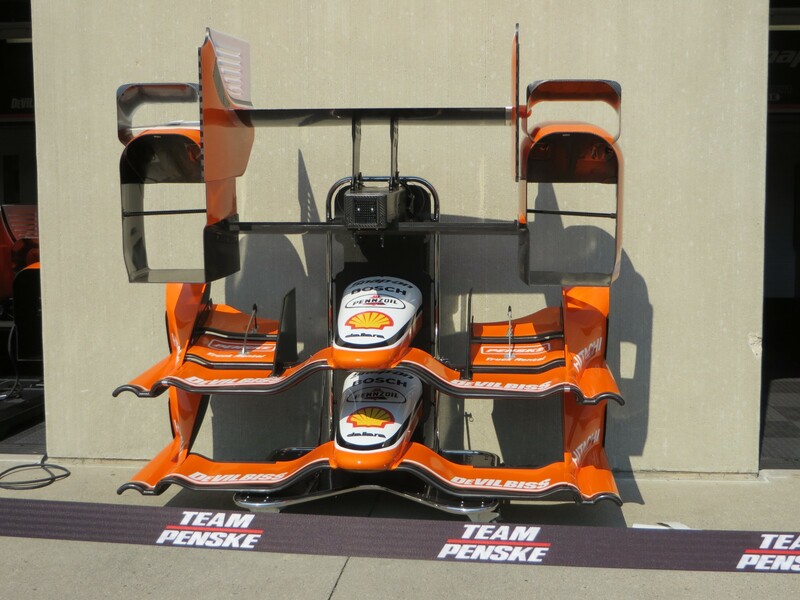 Castroneves sits fourth in the standings. Third place changed after midpoint, with Graham Rahal/No.15 Steak n’Shake Honda in that spot at the checkered flag. 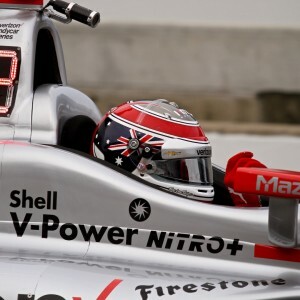 He is the top Honda driver in the standings, in seventh position. 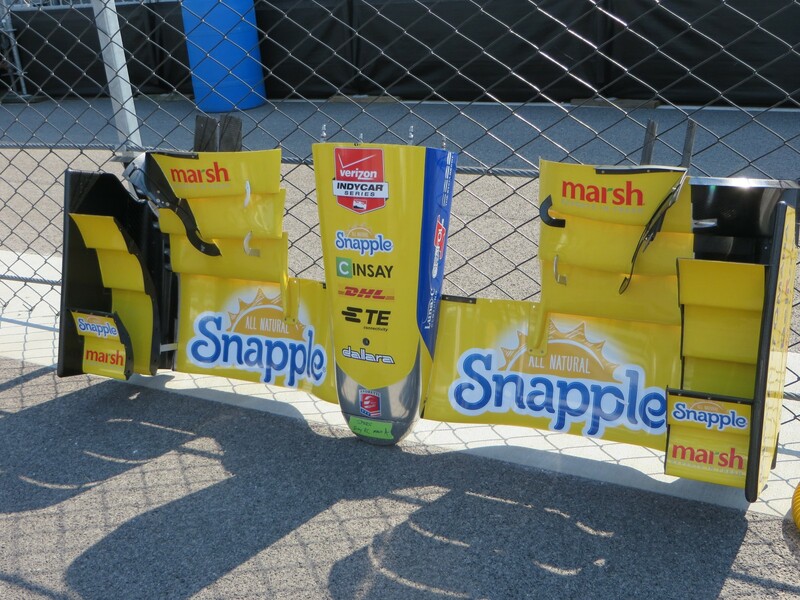 Fourth and fifth were Jack Hawksworth/No.41 ABC Supply AJ Foyt Racing Honda and Ryan Hunter-Reay/No.28 DHL Honda. 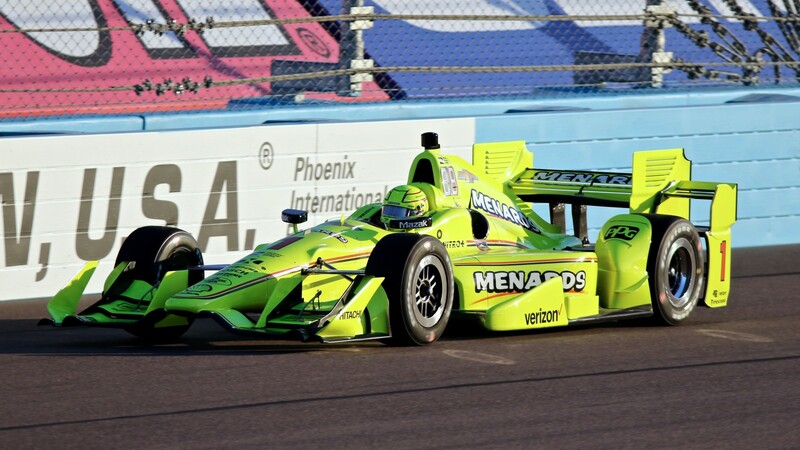 The contenders took it easy, with Simon Pagenaud/No.22 Hewlett Packard Enterprise Chevrolet running as high as fourth before ending in tenth place. 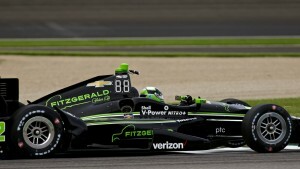 Meanwhile Will Power/No.1 Verizon Team Penske took it even easier, finishing seventeenth after running a high of ninth. 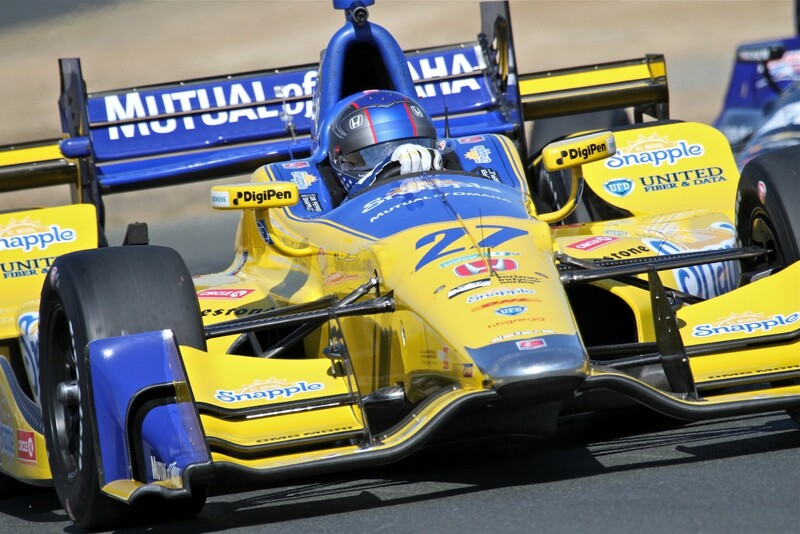 Alexander Rossi is the closest to being a ‘local’ driver, hailing from Nevada City in the Gold Country of Northern California. He was the top Rookie in No.98 Castrol Edge/Curb Honda, coming in eleventh after running a high of fifth. 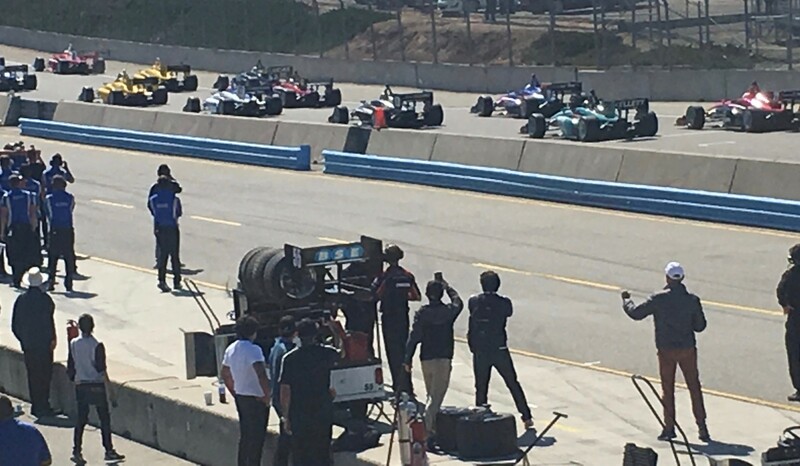 There are four other Rookies in the field – RC Enerson/No.19 Boy Scouts of America Honda, Spencer Pigot/No.20 Samsung/Fuzzy Vodka/ECR Chevrolet, Max Chilton/No.8 Gallagher Chip Ganassi Racing Chevrolet; and Conor Daly/No.18 Jonathan Byrd’s Hospitality Honda – who placed in that order. Also racing this weekend are the Pirelli World Challenge GTS and GT classes, although it is not their finale event. In the first practice, Austin Cindric/No.14 K-PAX Racing McLaren was top driver in the GT class, of sixteen. His lap was 1:33.723/91.610 mph. If you didn’t know, he’s the teenage son of Tim Cindric, President of Team Penske. Second and third were Johnny O’Connell/No.3 Cadillac Racing Cadillac ATS-VR.GT3 and JD Davison in No.33 AE Replay XD Nissan GT Academy Nissan GTR GT. Top PWC driver in GTA for Practice One was Michael Schein/No.16 Wright Motorsports Porsche 911 GT3 R, in P16, at 1:35.908/89.523 mph. was Second and third in GTA were Martin Fuentes/No.07 Scuderia Corsa Ferrari 458 italia GT3 and Cooper MacNeil/No.79 Alex Job Racing Porsche 991 GT3 R.
In PWC GT Cup Practice One, Mike Hedlund/No.35 Flying Lizards Motorsports Porsche 911 GT3 Cup was fastest at 1:39.135/86.609 mph, in P24. Second and third in this class were Alec Udell/No.17 GM Porsche 911 GT3 Cup and Sloan Urry/No.20 TruSpeed Autosport Porsche 911 GT3 Cup. For the Second Practice, fastest overall and in GT was Michael Cooper/No9.8 Cadillac Racing Cadillac ATS-V.R GT3 at 1:33.216/92.109 mph. 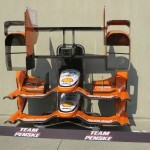 Second and third were O’Connell and Alvaro Parente/No.9 K-PAX Racing McLaren. In GTA it again was Schein at 1:35.105/90.279 mph, Fuentes and Colin Thompson/No.13 K-PAX Racing McLaren. In GT Cup, it was Tim Pappas/No.54 Black Swan Racing Porsche 911 GT3 R at 1:37.545/88.021 mph, Udell and Brent Holden/No.14 GMG Racing Porsche 911 GT3 R.
On the PWC Entry Sheet, No.66 DIME Racing Mercedes AMG SLS GT3 has Jonathan Summerton listed as driver. In Practice One, he finished twelfth in GT class and overall. In Practice Two, he was fifteenth in the GT class, nineteenth overall. 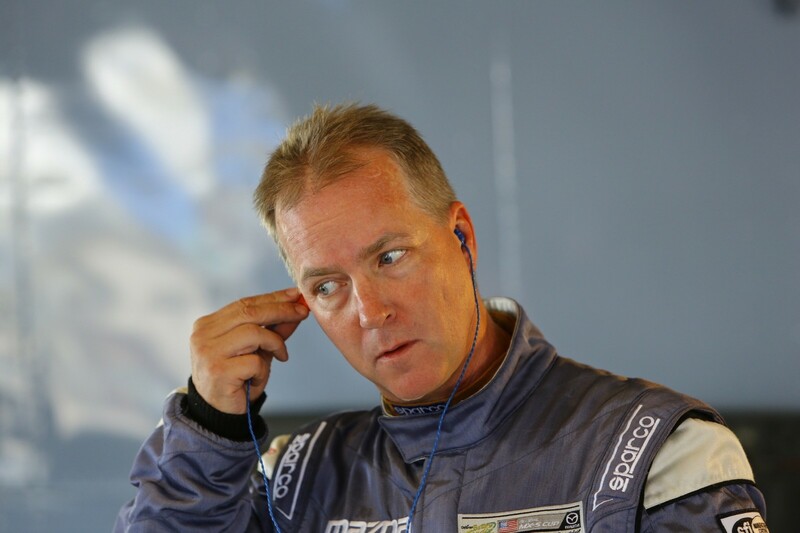 In PWC GTS Class, Kevin Marshal/No.44 VSA Motorsports Lotus GT4 was fastest at 1:42.348/83.890 mph. Second and third were Nate Stacy/No.14 Roush Performance Road Racing Ford Boss 302 and Anthony Mantella/No.8 Mantella Autosport Inc KTM XBow GT4. in the Second Practice, it was Kyle Marcelli/No.10 Blackdog Speed Shop Chevrolet Camaro at 1:43.348/83.079 mph in first place. Second and third were Stacy and Brett Sandberg/No.13 ANSA oorsports KTM XBow GT4. 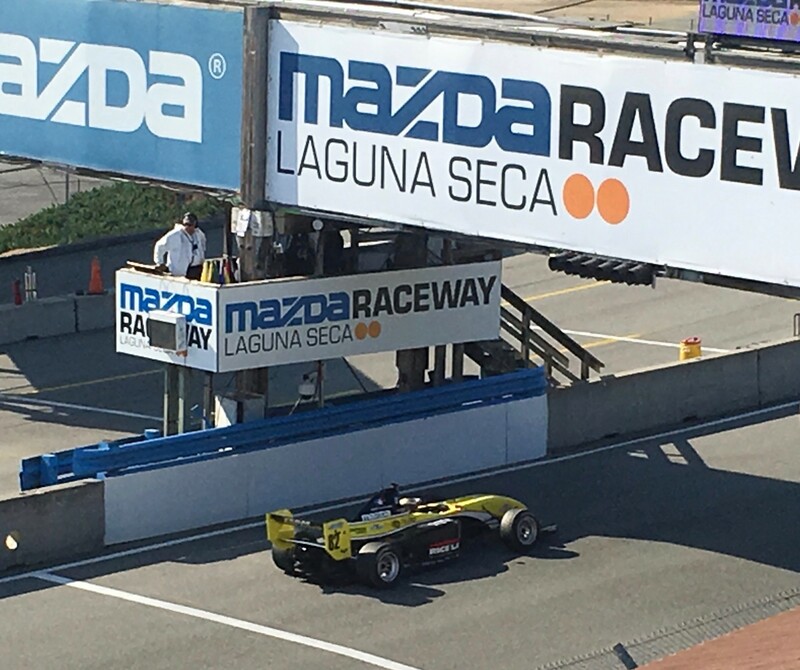 Also on the schedule is the Formula Car Challenge Series presented by Goodyear, which is an official feeder series to the Mazda Road To Indy. 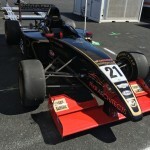 It is a spec series with multi-class racing – FormulaSPEED, Pro Formula Mazda, and Formula Mazda. While all three classes race together, the drivers are competing only in their respective classes for points and championships. 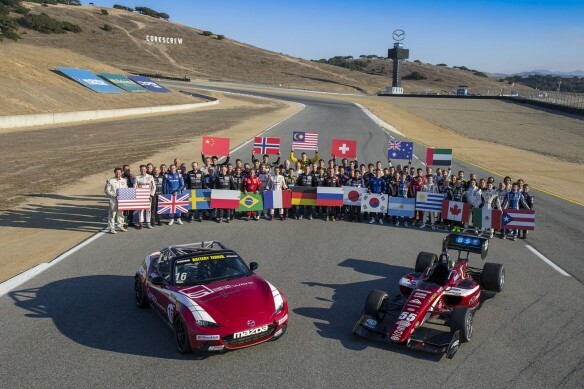 There are 26 drivers, with 12 in Formula Mazda, nine in Pro FM, and five in FormulaSPEED. Among the competitors are Bruno Carneiro who is leading the Pro FM standings while also competing and winning races in the Chinese FIA F4 Championship; Bob Corliss, CEO of Robert Talbot clothing; Aussie Joseph Burton-Harris, 2015 SCCA Formula Mazda National Champion and finalist in last year’s Mazda Road to 24 Driver Shootout; and 14-year old Sting Ray Robb who also races in the NASCAR K&N Series and karts. Joseph Burton-Harris/No.32 Build CSQ-World Speed Motorsports was fastest overall and in the Pro FM Class. Second was Carneiro in No.21 Rodizio Grill-Utah Motorsports Campus-Ian Lacy Racing, with Stan Kohls in No.8 World Speed Motorsports coming in third. All were in the Pro FM class. 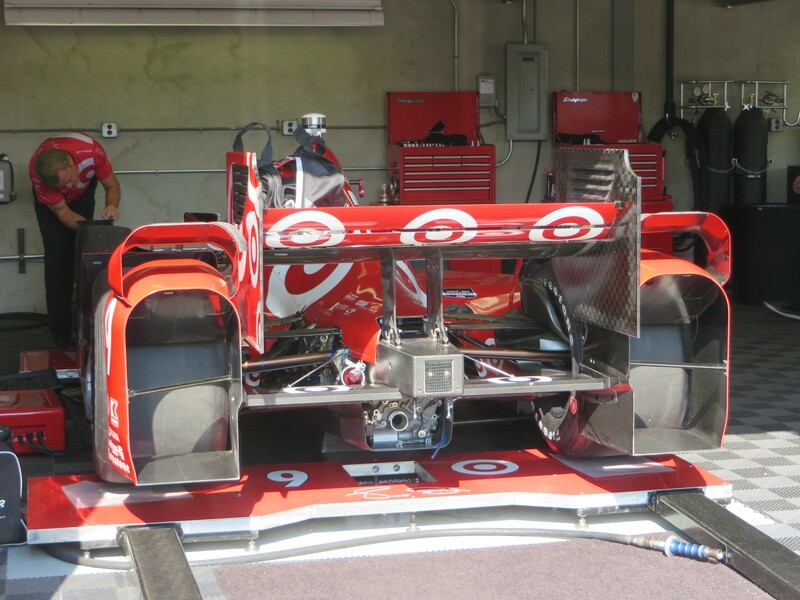 The IndyCar Series has a second practice, mid-afternoon, with conditions more similar to Sunday’s race. 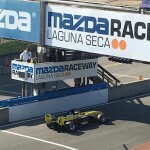 Sunday was a very busy day, with seven back to back Mazda Road To Indy races at Mazda Raceway Laguna Seca. 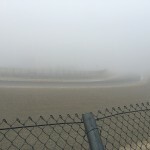 The day got off to a late start due to a two-hour fog delay. Lunch was abbreviated, to help make up time, but at least the SFR SCCA volunteer marshals and race officials got to come in for lunch and have a breather to sit down, after starting their day at 7am in the fog and ending at 5:40pm as the fog rolled back in. There was a lot of driving talent to be seen, with these development/ladder series races, and somewhat sad there weren’t more fans to enjoy the racing and the racers. 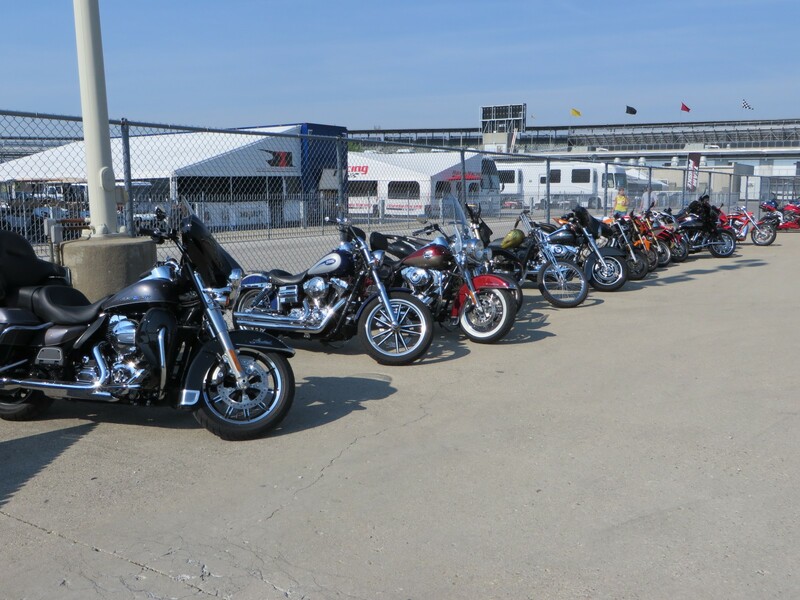 The paddock was wide open. They could have seen a future Indy 500 or Le Mans winner. 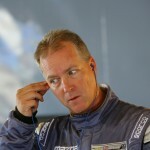 I spotted at least two talent scouts in the paddock, including IndyCar team owner Dale Coyne. Also on site and taking a turn at being interviewed on the PA was IndyCar driver, Max Chilton. 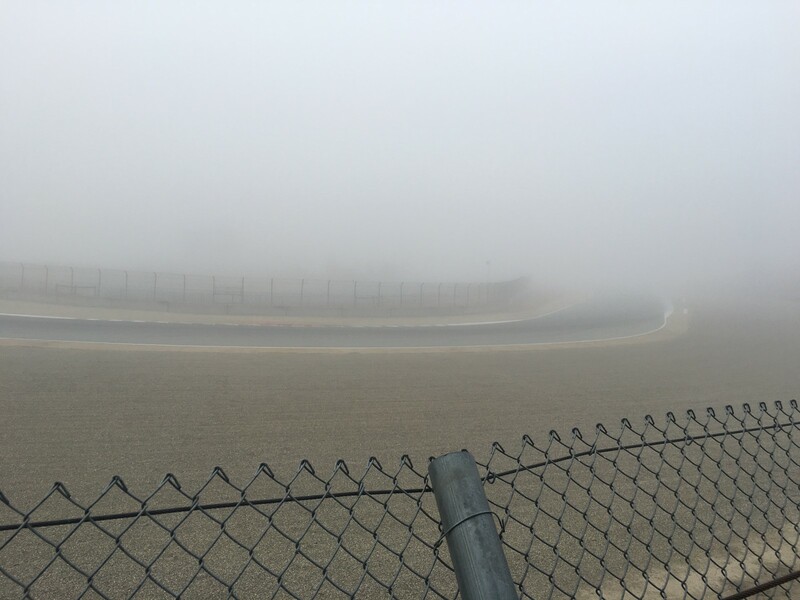 The Sunday afternoon Indy Lights Soul Red race got off to a rocky start and ended with what some consider a controversy. 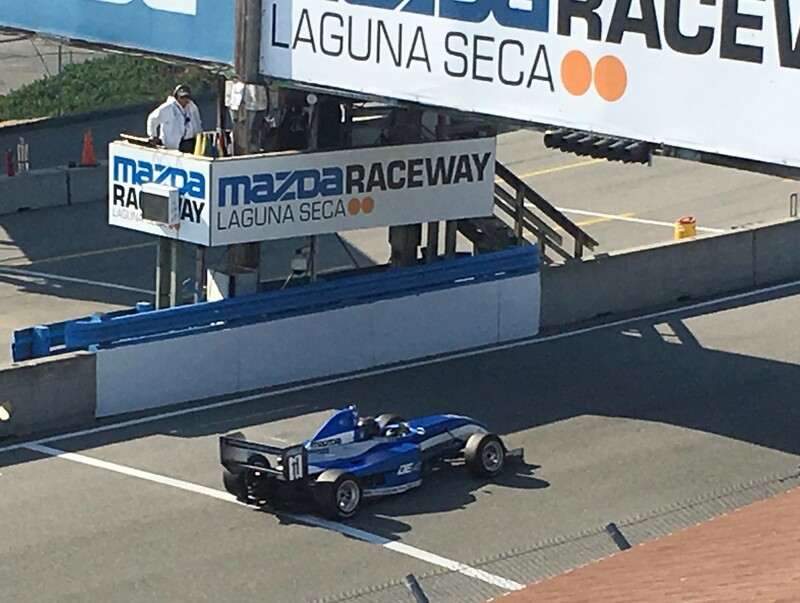 Title contender, Ed Jones of Dubai in No.11 Carlin had the pole position, and title contender, Rookie Santiago Urrutia of Uruguay in No.55 Schmidt Peterson Motorsports w/Curb-Agajanian started third behind Saturday’s race winner, Kyle Kaiser in No.18 Juncos Racing. 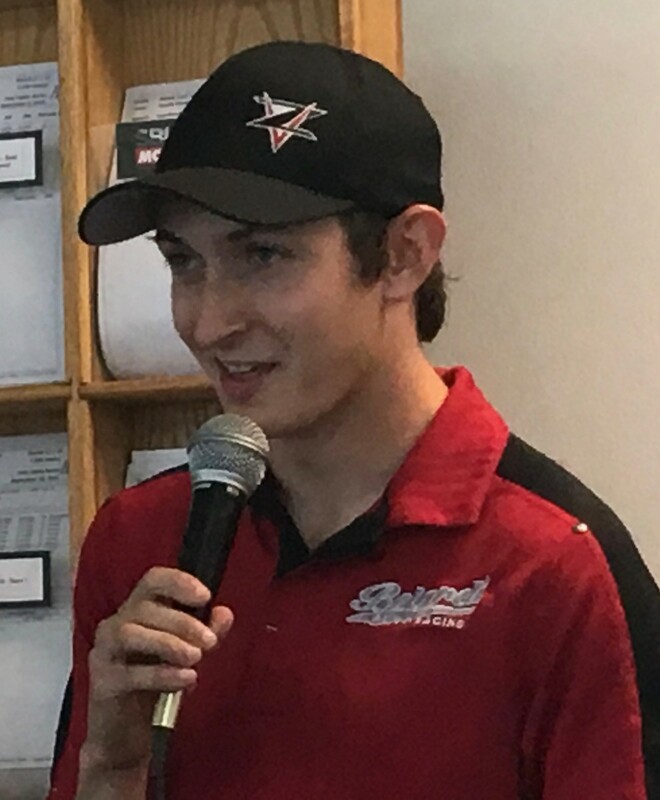 Zach Veach of OH started fourth in No.5 Belardi Auto Racing and Jones’ teammate, Felix Serralles of Puerto Rico, started fifth in No.4 Carlin. The first attempted start was ragged with the second row jumping the gun, so the starter waved them off. The 15-car field finally took the green flag on their fourth go-around, after two pace laps. The top five positions remained in lock-step for most of the race – Veach; Urrutia, and the two Carlin drivers, Serralles and Jones. The Carlin boys raced hard in the final laps, until the last lap. At that point the championship was on the line. 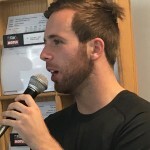 Urrutia would win the championship over Ed Jones, despite their equal points because Urrutia had more 2016 wins – four, and that would be the tie-breaker. Then on the last lap going into Turn Two, Serralles did an “After you, Alfonse” move, Jones passed and won the Championship from fourth place. Urruttia finished second, sans championship. Veach won the race, led the most laps and turned the fastest lap of 103.749 mph/77.6563 sec on Lap 5. 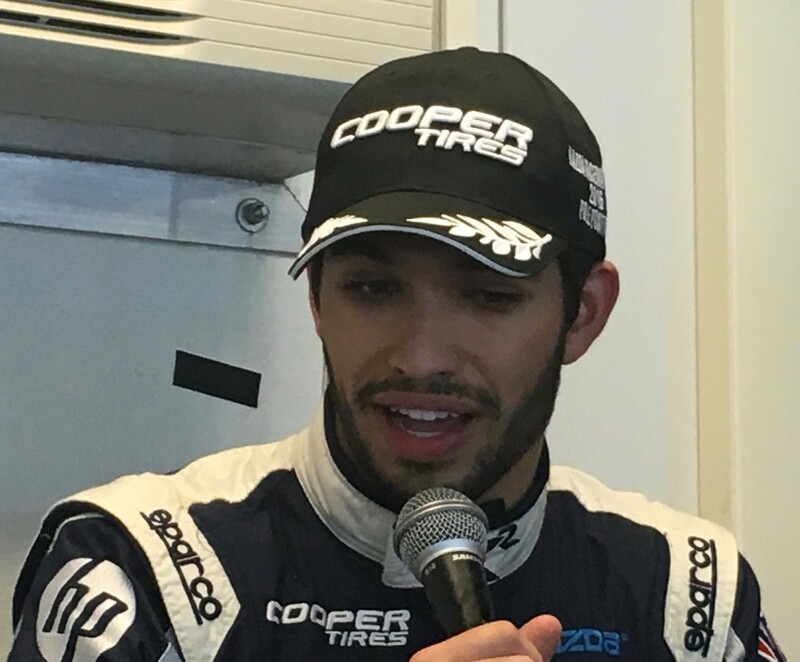 It was his third Indy Lights victory this season, and second in two weeks. It was painful to watch the podium ceremonies. There were some boos, and not a lot of joy – except for race winner Veach who was all smiles. 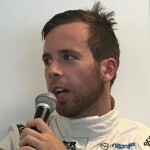 Jones won the 2016 Indy Lights Championship and with it the $1 million for a guaranteed three-races in the 2017 IndyCar Series, including the Indianapolis 500 race. 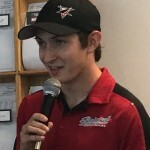 Veach said he’s had three years in Indy Lights and as he’s not a paying driver, and still without the necessary funding to go IndyCar racing, that’s still his goal and he’s hopeful. If he can’t race IndyCar next year, he wouldn’t mind another year in Indy Lights, and a second year with the Belardi team; as this year he was on a learning curve. Veach drove No.20 Ed Carpenter Racing Chevrolet at the IndyCar Sonoma Raceway Thursday, and reportedly was the fastest of the Indy Lights drivers testing that day. 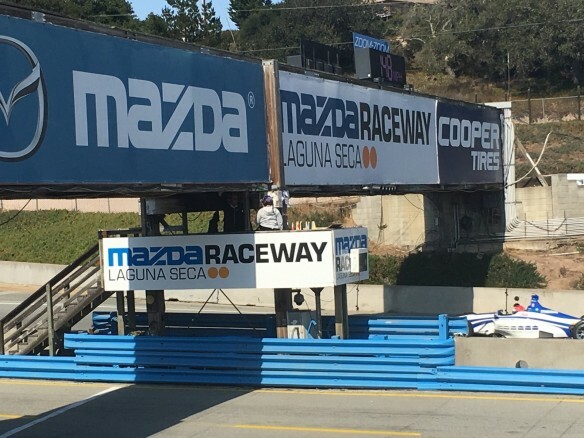 Mazda Raceway Laguna Seca is located on Highway 68 between Del Ray Oaks, Monterey and Salinas. The nearby area is still dealing with the Soberanes Fire, with one area still under evacuation and another evac order put out Saturday night, which was expanded Sunday afternoon. 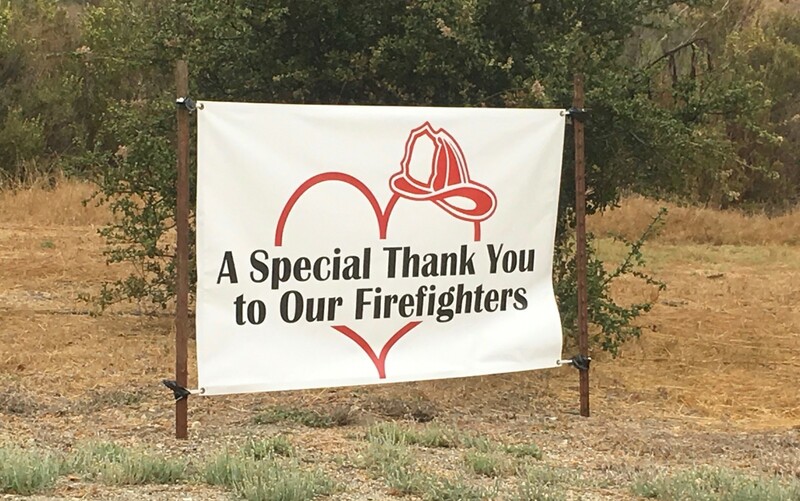 The wide-spread forest fire has been going on for 52 days, with wind and heat causing flareups in the rugged, inaccessible regions. 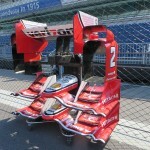 It’s the Merry Month of May and things are starting to get busy at Indianapolis Motor Speedway for several events. The weather is warm with hazy blue skies and a slight but welcome breeze. 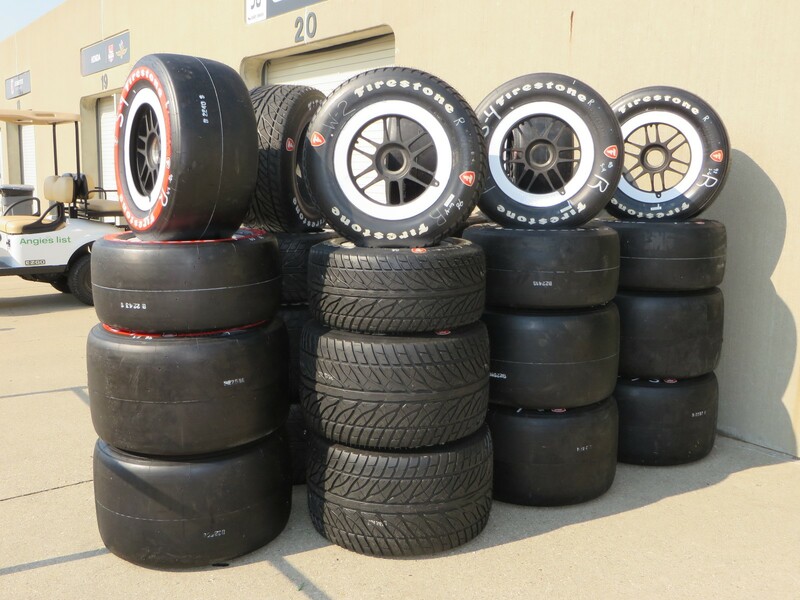 The Verizon IndyCar Series is quietly readying for its first practice session for Saturday’s Angie’s List Grand Prix of Indianapolis, on the road course. Twenty-five cars will run for two hours starting at 11am ET, and then again at 3pm ET for 100 minutes. 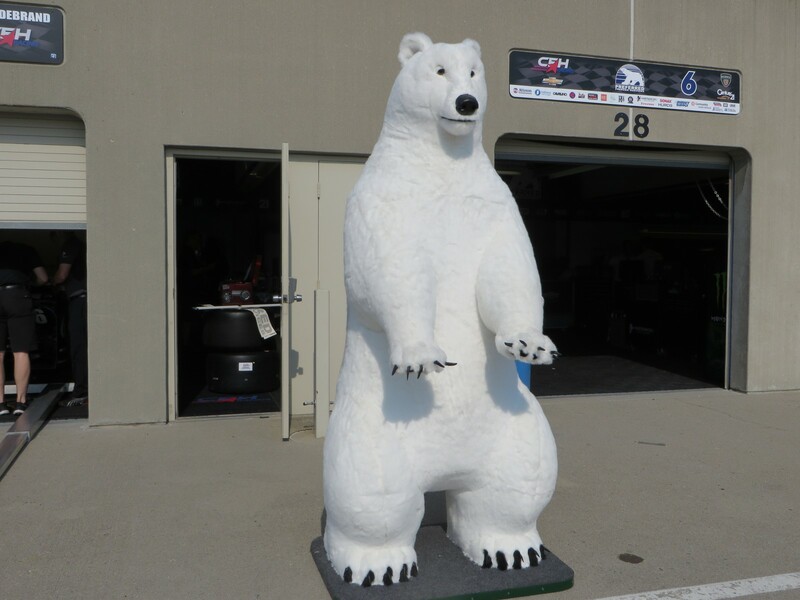 One new driver who hasn’t been seen yet this year will be Justin Wilson of England who will be driving No.25 Andretti Autosport Honda in both the road race and the Indy 500. He certainly is all smiles and glad to be back in the IndyCar Series, if only for the month. He’s optimistic about putting something together for more IndyCar races. Another familiar face back for this month is JR Hildebrand of Sausalito CA, driving No.6 Preferred Freezer CFH Racing Chevrolet. He also is running both races with CFH. 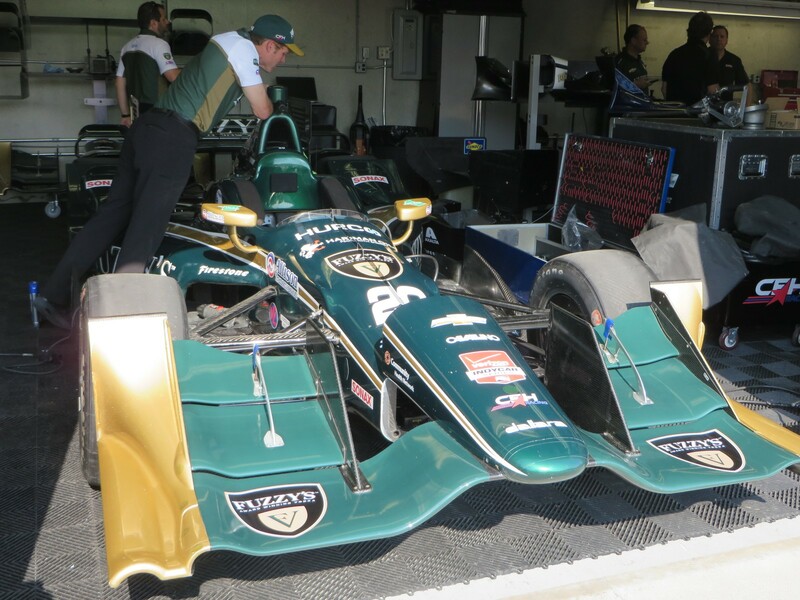 Last year he drove for Ed Carpenter, who is the C in CFH – Carpenter Fisher Hartman Racing. 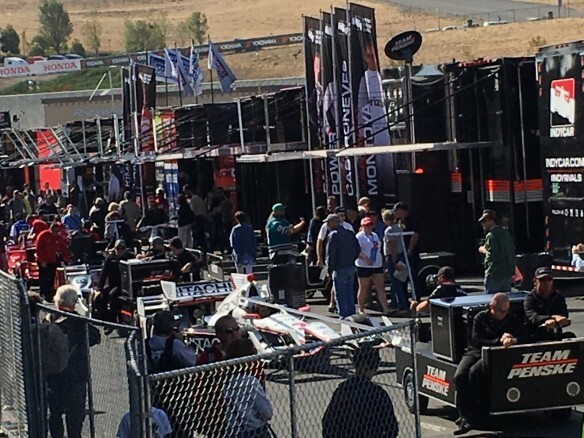 This weekend Dale Coyne’s road course drivers are Carlos Huertas/No.18 Dale Coyne Racing Honda, and Rookie Francesco Dracone of Italy in No.19 Dale Coyne Racing Honda. 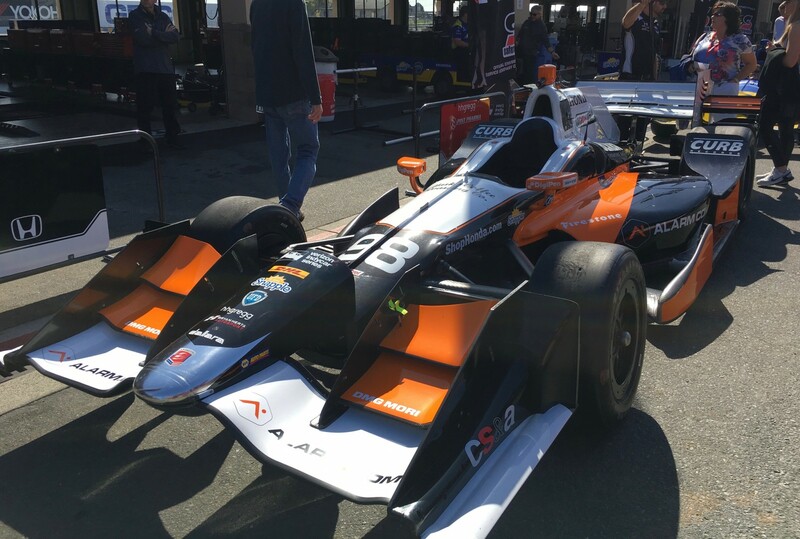 There are three Rookies for the road race – Dracone, Stefano Coletti/No.4 KV Racing Technology Chevrolet, and Gabby Chaves/No.98 Angie’s List Honda. 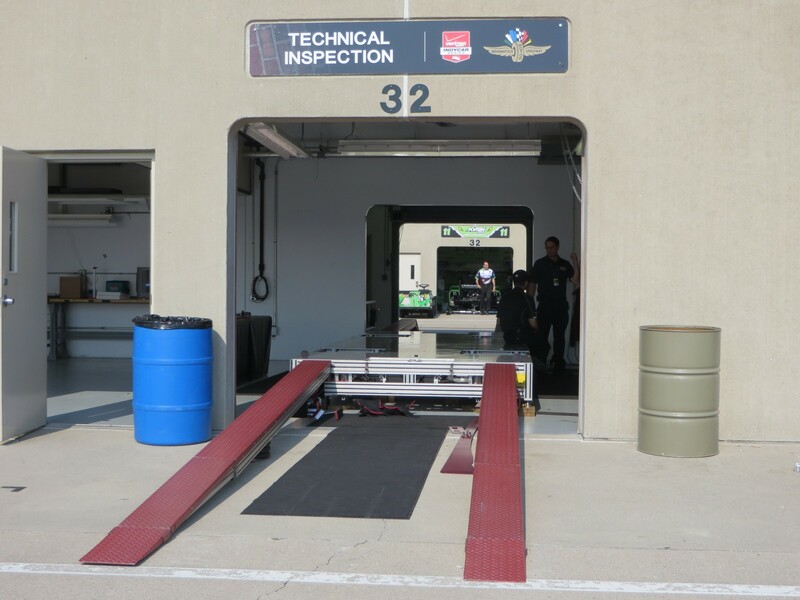 Only a few cars have gone through the Technical Inspection process, which is not required prior to being on track for the road course sessions. In Gasoline Alley, most of the cars which are in their respective garages are face in so all that’s visible is the rear end of the cars. 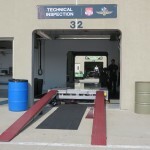 A few car parts are stacked up, and others are being carted off to Pit Lane. In between the IndyCars will be the Mazda Road To Indy Series – Cooper Tires USF2000 power by Mazda, Pro Mazda presented by Cooper Tires, and Indy Lights presented by Cooper Tires. 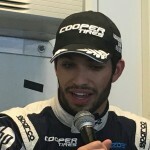 The USF2000 Series has 17 drivers, 12 of whom are Rookies. 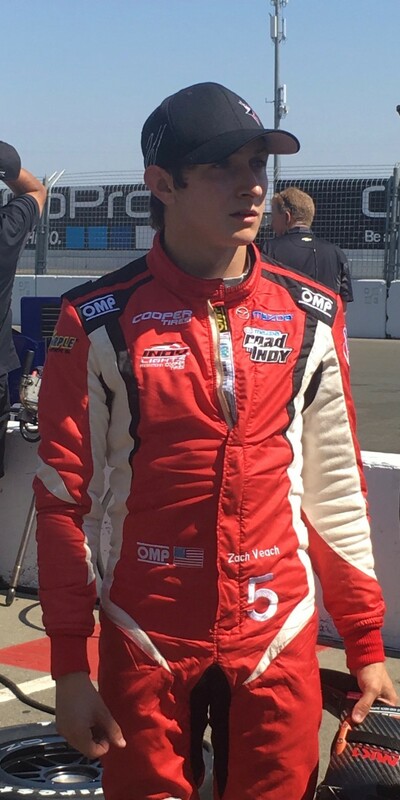 Pro Mazda has 22 drivers in two classes – of whom thirteen are Rookies and four are ‘Expert,’ which is a sub-class for the more mature drivers. 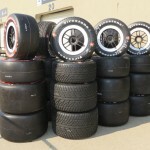 Indy Lights has twelve drivers, ten of whom are Rookies. 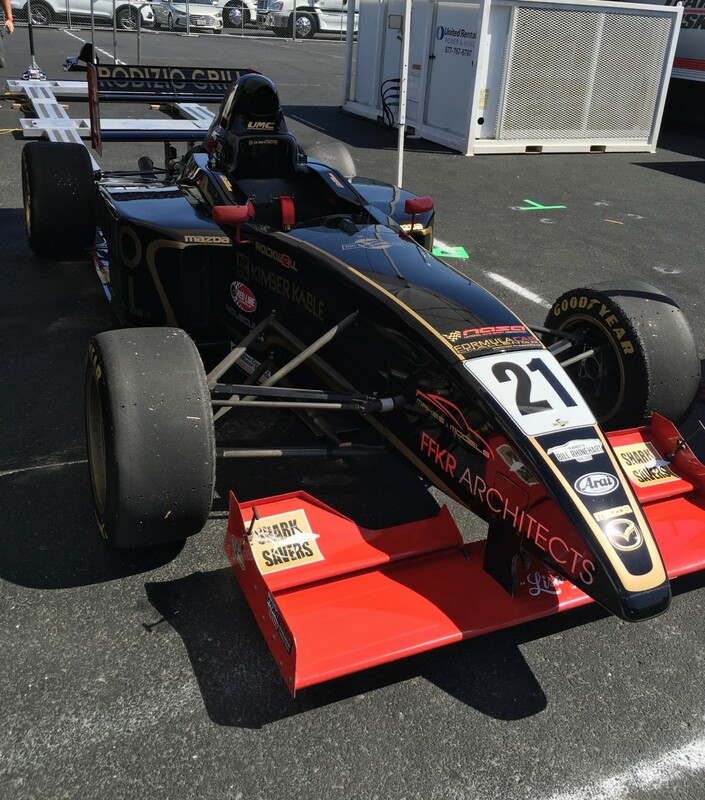 So far, in the USF200 Series, Nico Jamin/No.2 Cape Motorsports w/WTR was fastest in the morning practice, at 1:26.1732/101.892 mph. Rookie Timoth Buret/No.6 Juncos Racing was the quickest Pro Mazda driver at 1:22.4590/105.206 mph. 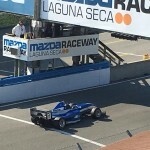 Rookie Ed Jones was the fastest Indy Lights driver in No.11 Carlin, at 1:15.7095/115.975 mph. 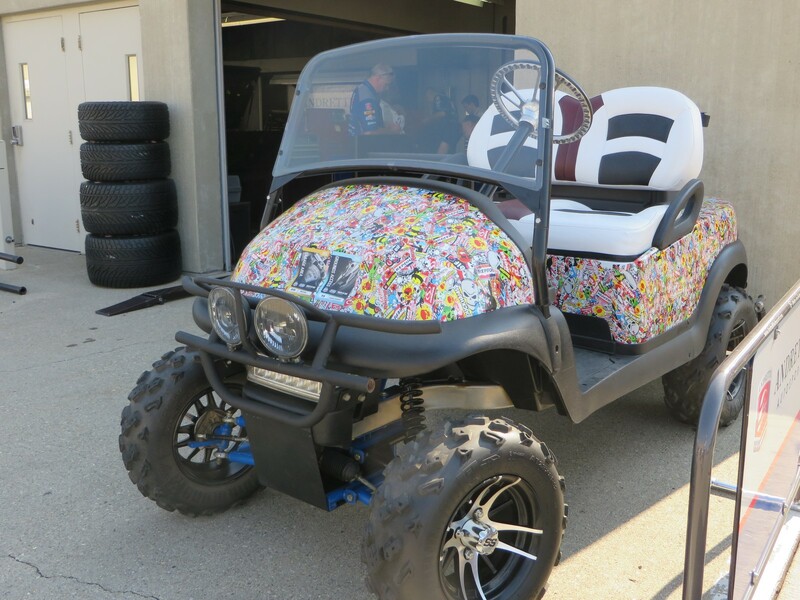 There is a variety of other vehicles and ways to get around the garage. 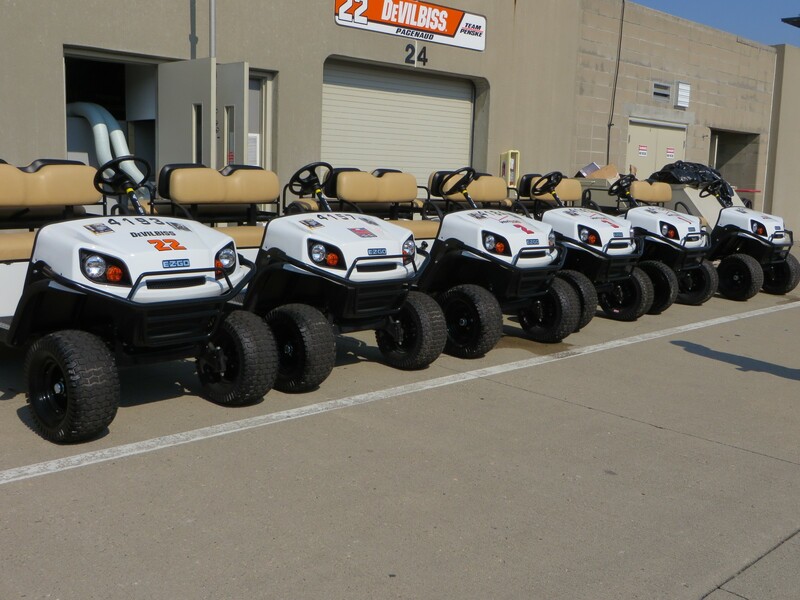 There are golf carts, and then there are golf carts.